As an amateur photographer, the quality of lenses used is impressive. The sharpness of focus and the depth of field are superb. In a lot of cases the lighting is good; in some cases it is spectacular. With the proper equipment, á la Bladerunner (Scott, 1981), it might even be possible to magnify a reflection in a smooth surface in a scene, a surface such as the cornea of an eye or the jewel of an earring, apply the appropriate anamorphic transformation, and see what the camera operator's face or hat looks like. As the episodes paraded across the television screen over the years, an inkling slowly began to form about what was happening photographically. 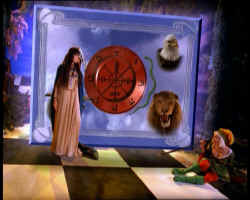 The first clue noticed was in THE BITTER SUITE (058/312) when Xena spun the Illusia-Callisto off into a corner. It looked like a painting. The second clue noticed was on a third or fourth re-viewing of BEEN THERE, DONE THAT (048/302), at the Argo funeral-pyre scene. Joxer moving on the horizon; Gabrielle motionless and almost invisible in the darkness beyond the firelight; and Xena seated. It was composed like a picture in an art gallery. Some memories from art classes began to flicker into life. But two times is coincidence, I thought. Three times and there is definitely something going on. 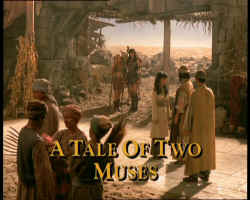 The penny eventually dropped with the opening title of A TALE OF TWO MUSES (074/406). With the composition, lighting, perspective, subject matter, even the range in the brightness spectrum from the brightest light to the deepest dark, the conclusion is unmistakable: we are looking at a Renaissance painting. Renaissance artistic rules (there are such things) are being followed. Also, an iconic visual language is being used to tell a story. In the center, attracting the viewer's attention first according to this visual language, there is a small group - three figures standing quietly, watching and waiting patiently, confident yet polite: Xena, Gabrielle, and Argo. They are neither out in the full harshness of the desert visible in the distance; nor have they been welcomed fully into the sheltering shade of the city. They are in limine, on the threshold. They are visitors waiting to be invited in. The place is ancient - it has ruins. It is also a cared-for habitation - the paving stones have been swept of sand. The strong contrast between the inhospitable "outside" and the relatively comfortable "inside" implies that survival will depend on cooperatively following a set of rules, more or less accepted by the denizens as a whole. Contemplating the fountainhead of such rules caused much philosophical discussion in the real Renaissance. Here in this episode, that fountainhead turns out to be a Muse, Calliope ("beautiful voice"). Closer to the viewer, and so having larger figures in perspective, is another small group: Tara and two males. Their posture hints at a fairly serious conversation, with some hesitancy, especially on Tara's part. Tara is standing on the outer, as if she too were recently arrived, but not as recently as our three girls. The episode will deal with her position in the city literally and metaphorically. Closer still, there is a more relaxed group: citizens of the city going about their everyday business, having just encountered each other in the street, probably discussing the value of grain or suchlike, comfortable in each other's presence. By the closeness of their members and the distance between groups, the groups are implied to be family units, if not by blood, then by a shared bonding. This episode is going to be a story about family values. There is a post-modernist twist present as well. On the one hand, keep in mind that a real Renaissance painting would have taken a large investment of effort to bring to completion. On the other hand, remember the images of the Zen monk patiently raking contemplative patterns in the sand garden of his temple. Now consider the set-dresser holding the broom on this episode. Creating the frames that form the title shot would have taken a Renaissance amount of investment and the patience of a Zen monk: all to produce something more ephemeral than a sand garden raking. Even three times could be a coincidence. A quick random sample reveals that there really is an intention at work: RenPics has Renaissance pictures all over the place. Someone who has been trained in the arts has a guiding hand in things. There is a skill at work. In fact, there are many skills. The best place to look for pictures is what I will call the "settle frame", the pause at the end of a camera track or pan. Composition, lighting, subject matter, perspective, angle of view and other things combine together in a harmonious way to form a composition. Composing, that is placing and positioning of the subject matter, is one of the foundations of a painting. 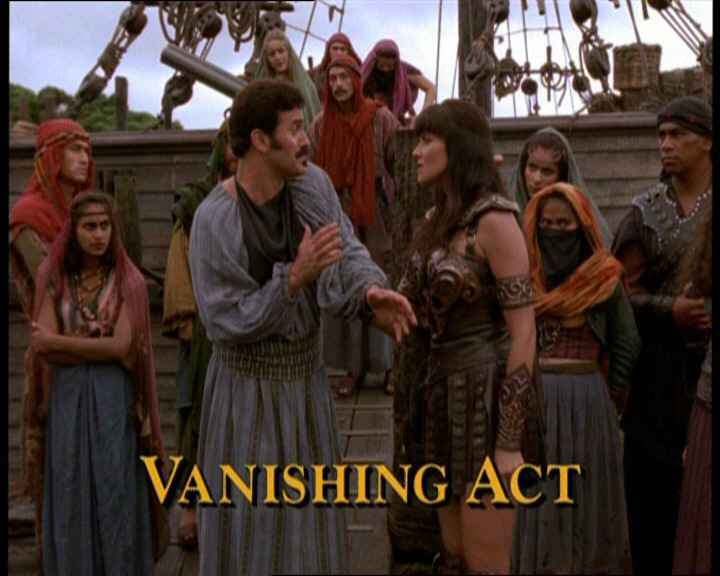 For example, the opening title from VANISHING ACT (066/320) contrasts Xena's stillness, balanced poise, and attitude of patronage (to coin a phrase) against Autolycus' defensiveness, movement and shifting of his weight. Meanwhile, a triangle of bystanders draws the eye upward to the top of the ship's ramp. 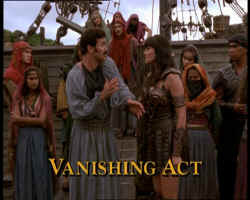 Autolycus is caught between the viewer and those on the ship, as well as by Xena and the people on the wharf. 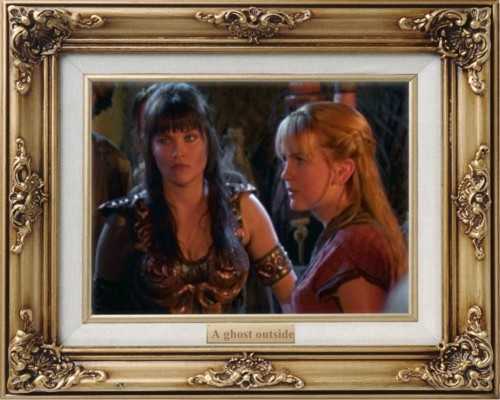 Note the yin-yang position of Xena and Gabrielle with respect to the edges of the picture, that is with respect to the camera's own "frame". Note also the detail of the bark container, a coolamon, beside Gabrielle on one side, and the chakram, staff and sword scabbard dropped, temporarily forgotten, in the sand on the other side. Plants provide a background for Xena, and sand a background for Gabrielle. Gabrielle is seated, Xena is standing. The implied direction of movement is also composed. In fact, it is a curve from Gabrielle's lips to the object of Xena's gaze. Imagine if either Xena or Gabrielle were facing the other way, to our right, instead of the way they are. The resulting direction of movement would not be a harmonious one. Also, Xena's fishing kite's control rods, from their carvings and handgrips, imply they have their own story to tell, adding a layer of iconic depth. The following image, from DESTINY (036/212), is balanced foreground to background, and left to right, and top to bottom. Caesar's right arm joins the two sides together visually as well as framing the background soldiers. 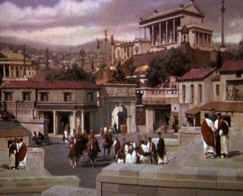 The waves intersect the line-of-sight between Xena and Caesar at the center of the picture. There is a Celtic intricacy melded in several dimensions with a Roman architectural simplicity in this picture. Trying to take a photo like this in real life is an achievement. Lighting and illumination were important topics for Renaissance painters. Perspective was being re-discovered at the time, and the behavior of light and light beams were being explored. A single candle could illuminate the subjects of a painting, or the reflections in a mirror would reveal the artist and their easel. 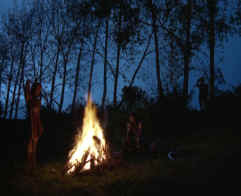 Xena has numerous examples of moonlit or campfire-lit scenes. 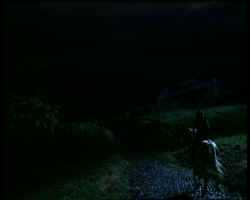 The most extreme example in terms of light is the "It was a dark and stormy night" scene from TAKES ONE TO KNOW ONE (087/419) as Xena is riding home to Amphipolis. Xena is quite adept as using light. Almost any scene illustrates this, for example, Gabrielle contemplating the raven lock in THE RHEINGOLD (119/607). Note the range in brightness from the white of the candle flames to the black of the background. This picture is also composed along the lines of the Golden Mean as well. The choice of a golden ambient light is also deliberate. The camera can be more intimate than a painter would ever think of, for example this picture below from PARADISE FOUND (081/413), with a flower on one side and flowers on the other. Again, the positioning, lighting, color scheme and visual textures creates a composition where the elements are in harmony with each other and the frame. Candid photos, where the photographer does not position subjects or otherwise actively compose the shot, are an easy by-product of modern cameras. For example, look at the photo below of Joan of Arc and Pocahontas playing cards in Mattie's waiting room in DEJA VU ALL OVER AGAIN (090/422). It is a nice touch story wise, because neither of them would have been able to read originally, or at least read waiting room magazines. Of course, this is not a real candid photo: it was composed, set up, lit, and directed (by the subject of the last photo). A characteristic of Renaissance pictures, not often realized today, is that they were intended to be big, to cover an entire wall or ceiling, to be literally a "big picture", one that was too big to take in at one glance, even from the other side of the room. Cameras can emulate this with long-distance shots and wide-angle, for example, like this establishing shot of Najara beginning her ride downhill in CRUSADER (076/408). A painting that covered a wall would have a lot of detail in it that would keep the eye occupied for a good while. 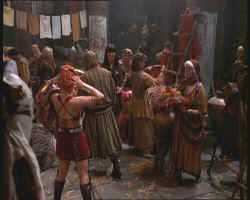 Here is a Xena equivalent, in this "Where's Xena?" shot with Gabrielle showing off a potential new hat to Xena in a crowded marketplace in THE LAST OF THE CENTAURS (129/617). Another big picture type in the Renaissance was the one that documented the city as the artist found it, or was paid by a patron to see it. 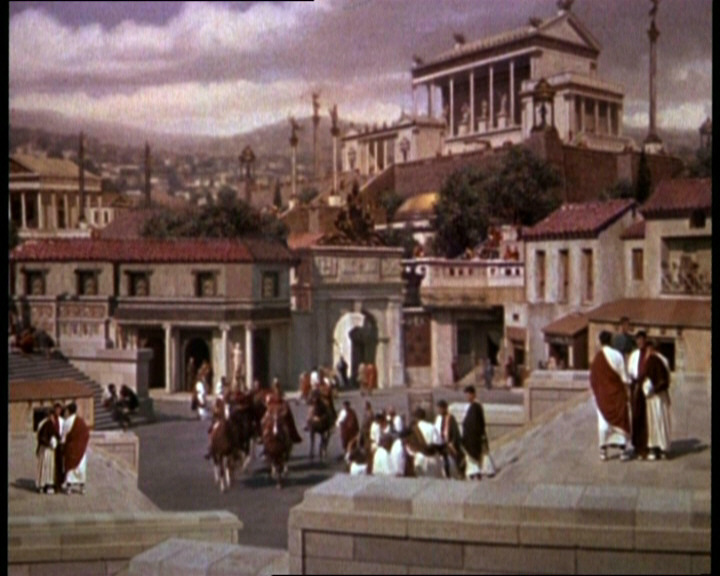 A Xena example is the city of Rome as seen in WHEN FATES COLLIDE (130/618) in this computer impression after the design department received their payment. Simplicity as well as sophistication was chronicled by painters. 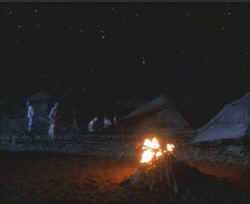 A Xena equivalent is this night scene of camping out in the desert in LEGACY (117/605). Besides presenting a view in general, where the camera location has no significant meaning in itself, the camera can present the view of a scene as a character or other participant in the scene would see it. Here are some examples of Xena's viewpoint. Of Gabrielle after getting off on the wrong foot in ONE AGAINST AN ARMY (059/313). Of Gabrielle the fishing assistant in FINS, FEMMES AND GEMS (064/318). Note the rippling wavelet generated in reaction to Gabrielle's act of reaching higher. Of Gabrielle as targeted prey and Xena as the predator in THE BITTER SUITE (058/312). Note the looking direct into the camera. The camera is explicitly standing in for Xena here. The camera also shows us what Gabrielle sees too, for example, the treetop-cam of FINS FEMMES AND GEMS (064/318). Usually the camera is in Unspoken-Friend mode, as a non-speaking participant in the action, as if it were another actor on the scene, like this spring-side scene in ONE AGAINST AN ARMY (059/313) as the women listen to someone with important news about an invading army. Or this fireside scene later in the same episode. 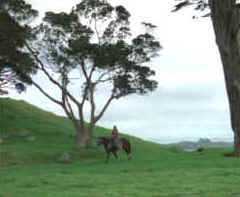 The camera's position is the same as the one that a pet dog or a child or travel companion would occupy if Xena and Gabrielle had one. Almost the same composition as the previous image, but with small crucial differences, conveys distance instead of closeness. It is a scene from DEVI (082/414). The camera takes a view from the ceiling, like a bat, in PARADISE FOUND (081/413). The camera is the fifth wheel in MANY HAPPY RETURNS (131/619). And there is a cheeky playfulness in where the camera comes to rest when tracking through Aphrodite's temple in THE QUILL IS MIGHTIER...(056/310). Kevin Smith was a well-rounded actor who had a good sense of humor. The camera is more than just a viewpoint. Sometimes it is the viewpoint of a non-speaking participant at the scene who is within touching distance of the main characters. 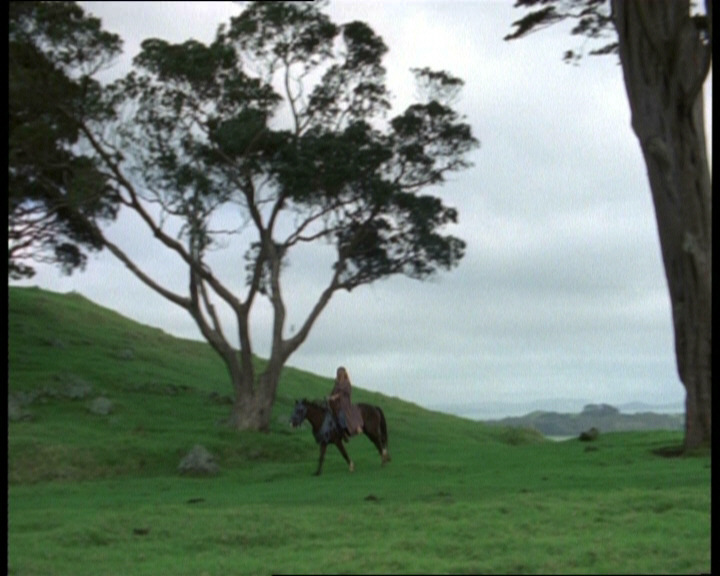 When Xena and Gabrielle first encounter Najara in CRUSADER (076/408), the hillside they meet on is bathed in light. Najara is facing into the sun, and Xena and Gabrielle are in shadow. The camera looks from one side of the conversation to the other, like a bystander. The conversation continues for several beats with the camera following the words. Then in a piece of subtle choreography the participants swap sides as Najara begins to ride off. Xena and Gabrielle end up facing the light. 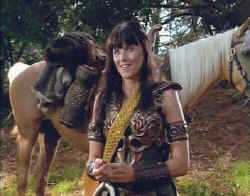 Najara pauses, turns back, and invites Xena and Gabrielle to accompany her. As she does so, she is looking down on them and it is her turn to be in shadow, in the darkness. Perhaps serendipitously, perhaps deliberately, this sets up a visual version of the motif of the episode. Najara's theme is about sending people "into the light"; Xena and Gabrielle are already there, because of her. There is also a practical reason for the camera's starting position here. 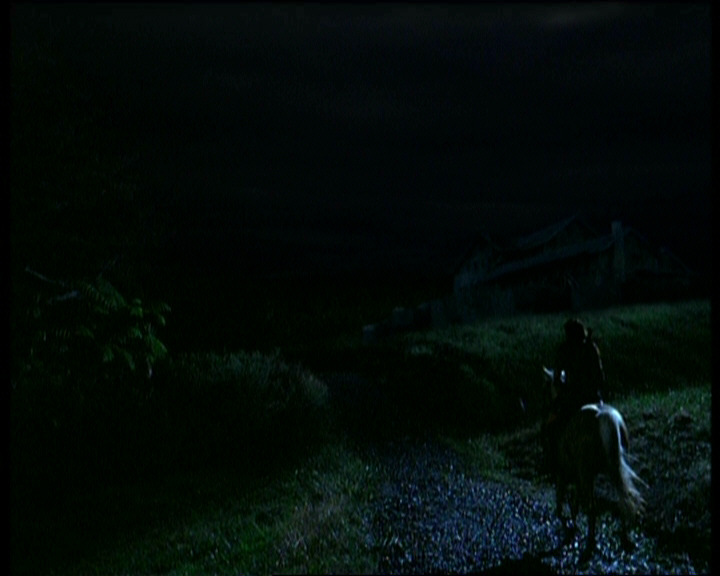 If Najara was on the camera's left, on this hillside the crew's shadows would fall across the scene and break the spell. 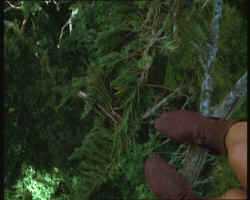 In ONE AGAINST AN ARMY (059/313), in the ruins of a settlement, Xena finds a phial that contained the remedy for the poisoned dart that hit Gabrielle. The phial is broken. There are no words spoken in that moment. 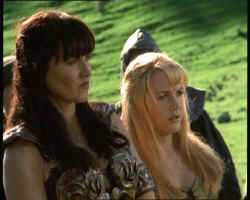 Both Xena and Gabrielle realize that time has run out. Sometimes the camera can speak - not verbally, but in how it frames the shots. 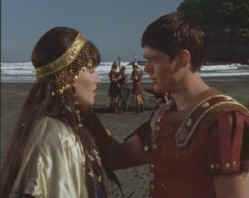 In one scene in MANY HAPPY RETURNS (131/619), Xena is talking to Aphrodite. Meanwhile, Argo II is waiting patiently in the background, swishing her tail. 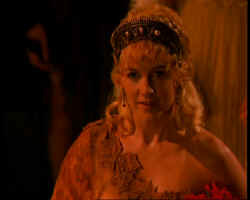 The camera then shifts to Aphrodite as she responds to Xena's suggestion. Meanwhile, in the background Gabrielle is waiting patiently, scratching her head with the point of one of her sais. There is an equation to be made here, perhaps something about Aphrodite's heifers or steeds, and it would be a brave person who would utter a phrase with the words "riding Gabrielle" in it. Best leave it unsaid and just smile. A little bit of visual innuendo is enough. A nod is as good as a wink to a blind horse, as the proverb says. The camera moves on to paint another picture. The camera can also paint. In a surprisingly large number of these outputs, the resulting still is good enough to frame or put in a gallery. Here are some examples chosen at random. The camera can do more than paint a picture. The camera can invite the viewer into a scene. Consider its placement during the banter at the start of MANY HAPPY RETURNS (131/619). The camera is at a distance from Gabrielle that a close family member or friend would be. It is also at an eye-level that a close family member or friend would have. There is a comfortableness in its placement, looking up to Gabrielle and across to Xena, rather than looking from an arbitrary position like the camera operator's shoulder. The banter continues across a series of images, paralleling the conversation, which happens to be about no practical jokes for Gabrielle's birthday; and Xena promises. A sequence of images can go one stage further, to beyond a mere sequence. 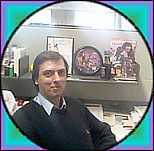 It can allow a dynamic to develop as one image creates itself in response to another image. From that dynamic, in turn, a more involved story can emerge than from just one picture alone. For example, in MANY HAPPY RETURNS (131/619), Gabrielle's curiosity is piqued by Gennaia's slightly anomalous facial expressions. They are not entirely consistent with what Gennaia is talking about. Note Xena's location and the camera's height and position. Finally, Gennaia cannot help herself and she blurts out a remark about Gabrielle's eye. Gabrielle is surprised and there is the beginning of a look of retribution on her face. She is on her own here. Visually, Xena has stepped out of the picture (for good reason). And so that next thing that happens is ...? We are able to anticipate what kind of action Gabrielle's next action is going to be. And so the story goes on. A story is a concept or idea that teaches us the language that it requires to become an idea that can be thought, and that would never have been thought in the first place had the story not existed. Like a magnetic field creates the electric field that creates the magnetic field, the one would not exist without the other. In the pivotal scene in WHEN FATES COLLIDE (130/618), when Gabrielle the playwright of Poteidaia for the first time ever catches sight of Xena the Empress of Rome, there is a mutual gaze that speaks volumes. The language of that gaze stops time, and there is a moment of Eternity when all the histories and possibilities of all the episodes of Xena are crystallized into one heartbeat. The viewer knows what it is that these two individuals have just now unknowingly sensed the presence of. And the viewer would not have been able to entertain that knowledge in mind without having learned it by going through those previous episodes. When I see Renaissance Pictures pictures, I see Renaissance pictures. 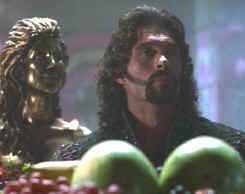 Almost any scene of Xena could be a picture that came out of the Renaissance. This is what I see when I look at Xena: Warrior Princess. To test the hypothesis that any Xena scene is frameable, I chose an episode at random and looked. In MORTAL BELOVED (016/116), I got 28 candidates before stopping at the point where Xena and Marcus debate about whether they should return to Hades' realm. Reducing the candidates down to 10 was difficult: the fight in the flower-field; Xena and Marcus entering Hades' hideaway; Xena, Gabrielle and Marcus talking to the bride's father; Xena and Gabrielle's departure scene on the lake shore: all these made good pictures. Here are the four that got the "frame" treatment. Incidentally, all of them use the Golden Mean as well. There is much to contemplate in things ostensibly not designed for contemplation, like sand in a garden, or scenes from a television show. Gerri Hill, One Summer Night (2000) c1, Rising Tide Press, Tucson, 2001, p11. Nothing much can be said that already has not been said. Office worker. Great South Land. Xena-watcher. Chose art at school instead of geography, and French instead of commerce. Thought it was a wise choice then. Still think it was a wise choice, n'est-ce pas?